On 18 January 2019, UNU-IAS and the Ministry of the Environment, Japan, in cooperation with the Global Environmental Outreach Centre (GEOC), co-organised a symposium on the important role of multi-stakeholder partnerships in implementing the UN Sustainable Development agenda, particularly at the regional and local levels. UNU-IAS Director Kazuhiko Takemoto and Director-General for Environmental Policy, Ministry of the Environment, Japan Tokutaro Nakai made opening remarks, and Senior Visiting Professor Kazuhiko Takeuchi delivered a keynote speech on “Creating Regional Circular and Ecological Sphere (Regional CES) through partnerships and the SDGs”. 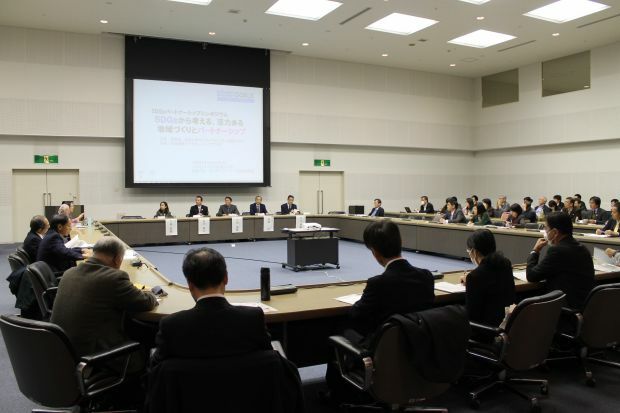 Takeuchi explained how the Fifth Basic Environment Plan was developed with regard to the SDGs, and the concept of Regional CES as one of the highlights of the revised plan. He stressed that it is important to build partnerships with a wide range of stakeholders such as governments, local organizations, private sector, academia and civil society to achieve the SDGs. Presenting a case study for localizing the SDGs, Eri Nakajima, Vice Governor of Nagano Prefecture, introduced the prefecture’s collaborative activities with small and medium-sized local enterprises, a decarbonization project, and the effective use of woody biomass energy. Yasutomo Suzuki, Mayor of Hamamatsu (Shizuoka Pref. ), explained how Hamamatsu city has promoted sustainable forest management with FSC certification, and provided educational and vocational support for Hamamatsu residents with foreign nationalities. Takamasa Ishihara from Raihatome Industrial Company shared his experiences of incorporating SDGs into management and raising awareness among employees. In a panel discussion that followed, moderator Mariko Kawaguchi, Executive Director at Daiwa Institute of Research, pointed out that it is important to ask yourself what SDGs mean to you and why you promote them. In responding to her call, panelists shared their own experiences related to the SDGs along with their motivations and wishes for achieving a sustainable society. The panel also discussed how solving environmental issues and economic development can be compatible and advancing SDGs can make the organization sustainable and bring more profits from a long-term management perspective. Developing effective outreach strategies to enhance understanding of the SDGs was also raised as a topic, and speakers stressed the needs of presenting SDGs in a way to which everyone can easily relate.